The file storage extensions for webmail allow users of the webmail client to upload and save normal files (like pictures, documents, videos, etc.) alongside their email messages. As such, the webmail client has been extended to allow the storage of files in a dedicated File Storage Folder. An advantage of this is that it allows users to store their attachments on the server, so they do not need to upload them when composing a message. It will also allow them to make use of a new image-share/publishing feature, where users can make a storage folder public so that others can browse their photos, view their videos, etc. From the File Storage view, select the files you wish to attach to a new email, then click the Send Files button. From the Compose page, click the Attachments button. Then, from the Attachments page, click the Add from Storage button and select the file you wish to attach. B. Save mail attachment to File Storage From the message page, click the Attachments button. Now, from the Attachments page, click the Save to Storage button. C. Upload file from local machine to File Storage From the File Storage view of the target folder, click the Upload File button, then select the file to be uploaded. 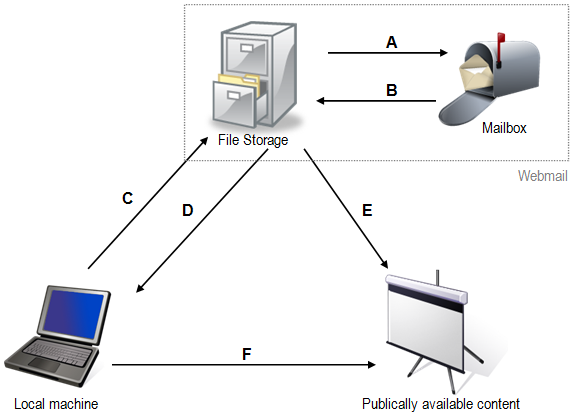 D. Download file from File storage to local machine From the File Storage view, select the file you with to download and click the Download File button. Then select the location to save to on the local machine. From the File Storage view of the folder to be published, click the Publish Options button. Next click the Publish radio button—this will generate a URL through which the folder can be viewed. Copy the URL for future reference, then click the Okay button. Now anybody can browse the contents of the published folder online through the URL just generated. To preview what other users will see when they browse the published folder, click the Test Viewer... button on the left-hand panel. F. Browse other users' published folders over the web If another user publishes content, they can send you a URL to that content. Simply visit the URL in a web browser to view it. See the File Viewer page for more information. It's possible to use an image stored in file storage as a webmail background image. For more information, see the Personalise options page.